Some of the places where we have fun with our clients. Clients having fun and getting fit in parks or at home. Workouts are tailored to your fitness level and ability, using a variety of exercises and equipment. A colourful 5 km fun run at CentennialPark. A colourful 5 km fun run at the Olympic Park. 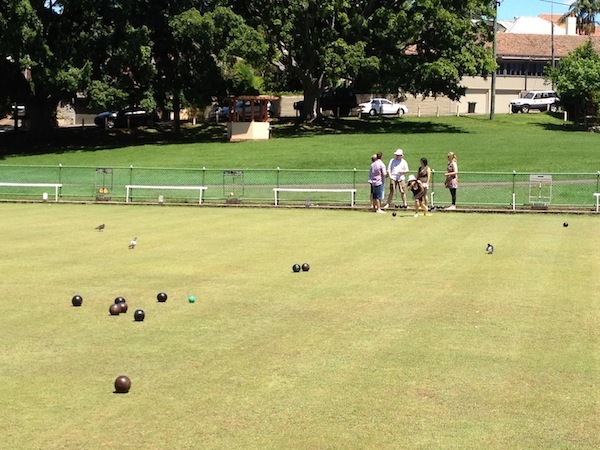 After a week of rain, the sun greeted us on our social day on the bowling greens. While it was not as energetic as some of our other social events, everyone had a good time showing off their skills. A beautiful morning greeted us for our bike ride around Manly. While we unfortunately didn’t see any whales, we did encounter another form of wildlife. Indoor rock climbing is not just physical, but also a mental challenge. Our last kayak day till spring. The rain stayed away and it was a little cool but overall a good morning out in the harbour. The hot chocolates and coffees at Nielsen Park warmed us up. Great day to be out in Sydney Harbour. We kayaked from Rose Bay to Nielsen Park Vaucluse for a coffee and then back to Rose Bay. Perfect kayaking day – can’t get any better than this!! We kayaked from Rose Bay to Redleaf Pool at Double Bay for a coffee and then back to Rose Bay.